Total Shipping Time is based on the time "it will take to tailor your dresses + the time it will take to ship it to you". It will take 4-9 days to tailor your dresses and wraps by our professional dressmakers. But some dresses with more elaborate designs or detailing may take longer to tailor, thank you very much for your understanding. It will then take about 3-6 days (Accoreding to the Shipping Method you select when you buy the dress.) to ship the package to you. The exact shipping time is based on the shipping company (UPS, DPD, DHL, TNT, etc). This time is actual shipping time, the time that couriers take to send the packages to your address. You can choose shipping method from our shipping methods, such as: Super Saving Shipping Method, Expedited Shipping Method , Standard Shipping Method.If your order is free shipping ,we will use the most quickly shipping method. Total Delivery Time of mixed orders with items in different dresses should be calculated using the longest estimate times listed. The shipping cost is determined by the specific order information. How Do You Sell Dresses at Such Low Prices? 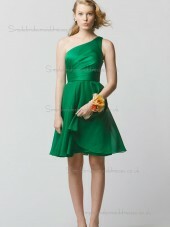 Simplebridesmaiddresses.co.uk is able to offer its dresses online 50% - 80% off retail prices for 2 key reasons. 1. We operate with lower overheads than a local retail store. We do not need to rent the store and employ sales staff or an alterations department. 2. We have our own factory, and dresses are shipped directly from our factory. Prices are much more competitive than other retailers, which can save you at least 70%. What is the fabric of your dresses? Most product pages list the fabric of that particular dress. If you need information that is not listed on the product page, please contact us. I need a dress in a hurry. Do you offer any prom dress for immediately delivery? We are pleased to offer RUSH orders for nearly all styles in our collection. You will receive the dress in 4-5 days if you need a rush order. Do I have a choice on the back closure? As a matter of fact, on most styles, you do! We are designing more and more dresses available with an optioyun for a zipper or lace-up back. And to make it even better, this customization comes at no extra charge. Of course not every dress is available this way, but do ask our customer service. You can choose a standard size or give us your custom measurements. Please view our Size Chart prior to selecting your size to order, we suggest reviewing the information provided on the product page. Even if there is some fluctuation in the size you need, all our dresses are made with a margin for modification or alteration. The modification or alteration can be made by your local tailor. What modifications and alterations are normally done to a dress to make it fit? Side seams and Back Seams - The side seams and back seam in the torso can be taken in or let out to make a dress fit. This is true even for gowns ordered to size. Evening Dresses are usually made to allow the side seams to be let out up to 3 inches or 1-2 sizes*. Additionally, the back seam often can be let out slightly to size up further. Shoulders - It is also common for shoulder seams to be taken in to bring up a gown. Hem - The length of a dress can be shortened only and is affected by the height of the shoe you are planning to wear. Some gowns can only be shortened from the waist. Other gowns can only be shortened by taking up the hemline. Bustle - The bustle is a way to hook the train up in the back so that the dress can be worn comfortably when dancing. Bustling a dress is part of the alterations for any gown that has an attached train. What is the delivery time for orders? It usually takes 8-12 days for your dresses to process and about 3-5 business days for the package to travel from our facilities to your destination, the exact shipping time is based on the shipping company standard. It takes about business days for us to make and ship the dresses you ordered on dresseshop, so please kindly make an order about a month in advance to make sure receiving them in time. Please place your order as far as in advance of your event date as possible. By doing so, you will allow ample time for production and shipping. It also affords you a comfortable time frame to accommodate any alterations if necessary. 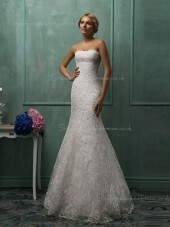 Pressing for any gown is done after alterations and a few days before your special event. It can be done either by your seamstress or a dry cleaner. Be sure to ask your seamstress whether they will be pressing the gown. There usually is an additional charge for this service other than your alteration cost. If the event will be in another state/country than that of where the alterations are being done you will need to find someone else to press your gown. The pressing should be done as close to the event date as possible. Be sure to find out in advance how much time they will need to press the gown. Some places will require the gown 72 hours before your special occasion. 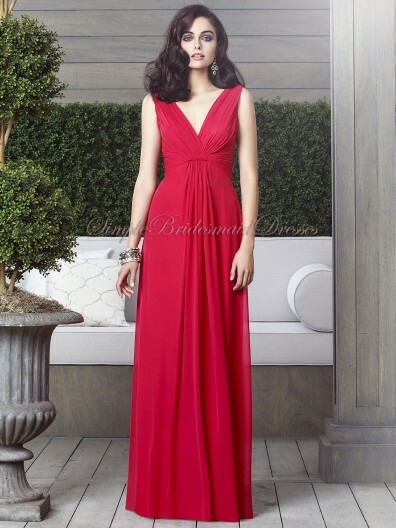 How is the dress shipped? We will be sending you the dress inside-out (to protect the beading), in a plastic bag to protect it from water and dirt. After your alterations are complete and before the event, you will need to send your dress to be professionally steamed or pressed. How much does it cost to ship to my address? Shipping costs are calculated individually for each order based on the number and weight of items in your order, as well as destination and shipping method chosen, and it will be calculated automatically at the checkout page. Can I exchange the size and the colour of the dress I have ordered in the process of production? These dresses are not just pulled from a warehouse - once your order is confirmed, our tailors begin selecting materials in the colour you requested and cutting fabric based on your measurements. 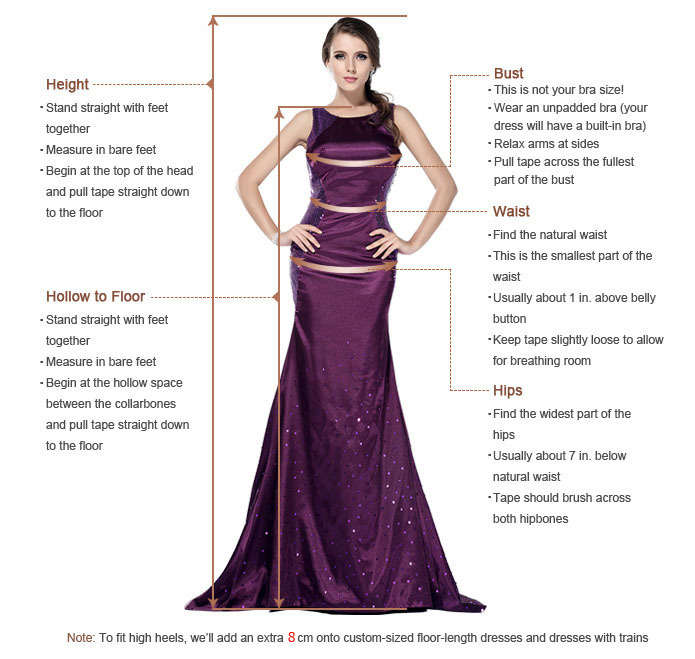 Even standard size dresses are made-to-order for each customer. Therefore, if you want to change the size of a dress you can only do so by canceling your order and then ordering a new size. Please check the cancellation policy for more information. Can I cancel my order in the process of production? We understand that every piece means a lot you and our cancellation policy was formulated with this in mind. As there are different selections of items, there are different cancellation policies. If you would like to cancel your order, please do contact Customer Service and request cancellation. Will the dress be made to allow further alterations? Yes, of course, the tailor will made enough room for adjustment at the seam. You can also ask for a specify way for adjustment, for example, straps style back instead of the zipper on the back. Can I return the dress? Yes, Please check the cancellation policy for more information. Do you offer custom-made service? Yes, we do. If you cannot find the right size in this section, please write to us, listing your special request and right measurements. Our customer service will follow up and you can make further discussion. Can I order fabric swatches or material directly from you? Yes, we sell swatches for you to know exactly what the dress material will be like. You can also buy the material directly from our site. For more questions, please contact with our customer service. We always have someone on hand to answer your questions: 24 hours a day, 7 days a week. We believe in the timeliness of customer service, and will do everything possible to satisfy our customers. If you have any problems, comments, or suggestions, please contact our customer service representatives. Ich habe dieses tolle Kleid für meine Brautjungfern gekauft. This dress is so beautiful! ! !My bridesmaids will be very happy when they get the gift I provide for them!